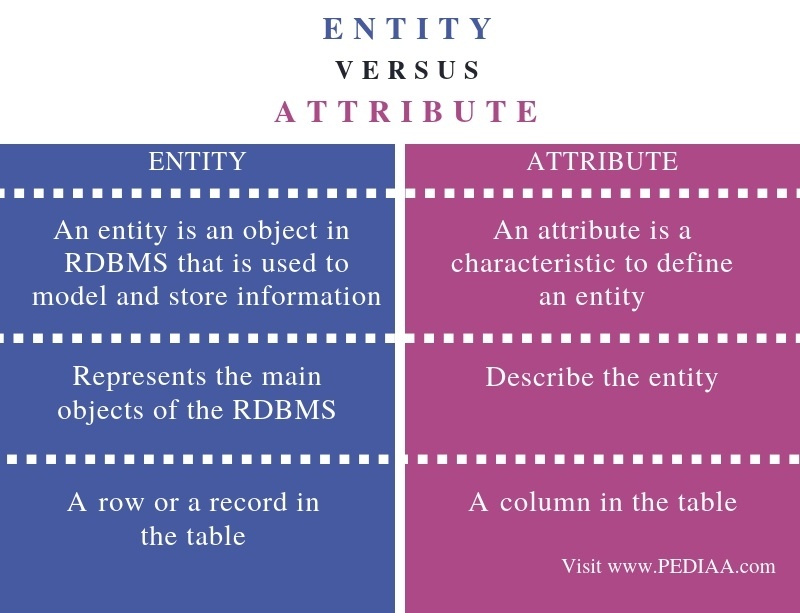 The main difference between Entity and Attribute is that an entity is a real-world object that represents data in RDBMS while an attribute is a property that describes an entity. Relational Database Management System (RDBMS) is a type of database management system based on the relational model. It helps to store and manage data efficiently to access them easily. RDBMS stores data in tables or relations. Each table consists of columns and rows. Before creating a database, it is essential to design a database. An ER diagram helps to accomplish that task. Entity and Attribute are two concepts related to ER diagrams. An entity is a real-world object that represents data in RDBMS. For example, assume a university management system. It stores information about students, lecturers, courses, exams, etc. The Student, lecturer, course, and exam become the tables in the database. A record in student table is called an entity. It represents a single student object. Similarly, a record in lecturer table is an entity. It represents a one lecturer object. These entities are called strong entities. There is another entity type as a weak entity. A weak entity depends on another entity. For example, an exam entity depends on the course entity. So, it is a weak entity. In an ER diagram, we can represent an entity using a rectangle. Moreover, we can represent a weak entity using a double rectangle box. Attributes are properties that describe an entity. Let’s look at the example of a university management system again. The student entity has attributes such as student id, name, age, address, GPA. The course entity has attributes such as course id, course name, duration. Moreover, the exam entity has attributes such as exam number, date, start time, end time, etc. These are various types of attributes. They are as follows. Composite attribute – It is a combination of more than one simple attributes. E.g. – Name consists of first name, middle name, last name. The address can consist of house number, street name, city, etc. Derived attribute – The attribute is not available in the RDBMS but we can find this attribute using other attributes. E.g. – We can find age using the date of birth. In an ER diagram, we represent an attribute using an ellipse. We denote a derived attribute using a dotted ellipse inside the main ellipse. Moreover, the multivalued attribute is symbolized by a double ellipse. In the database, the columns of the table are the attributes. An entity is an object in RDBMS that is used to model and store information while an attribute is a characteristic to define an entity. Thus, this is the main difference between Entity and Attribute. Furthermore, another difference between Entity and Attribute is that an entity represents the main objects of the RDBMS while attributes describe the entity. Also, an entity is a row or a record in the table whereas an attribute is a column in the table. RDBMS is one of the most widely used database management systems. However, it is necessary to design the database before developing it. 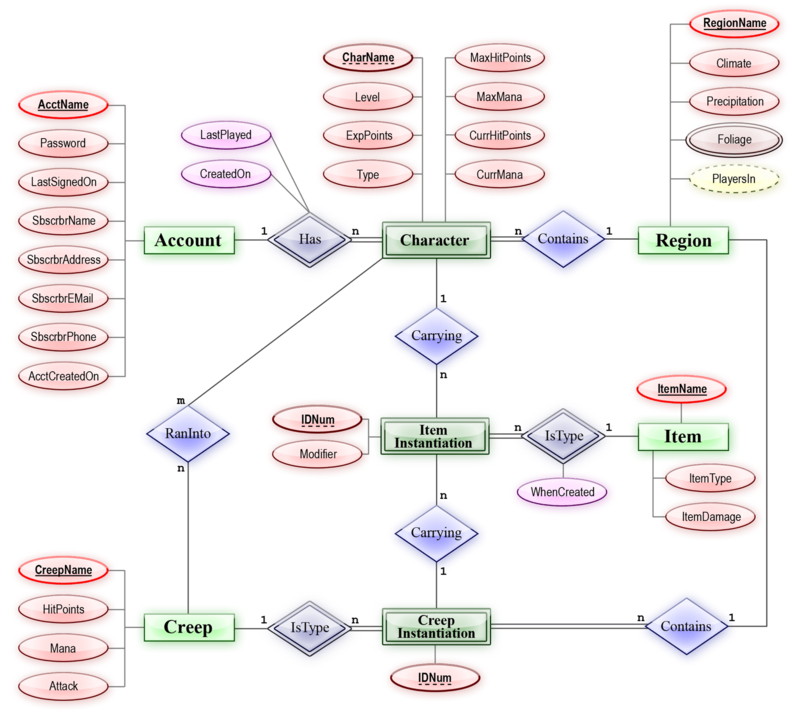 Entity and attribute are related to ER diagrams. The main difference between Entity and Attribute is that Entity is a real-world object that represents data in RDBMS while Attribute is a property that describes an entity. 1.“Basic Concepts of ER Model in DBMS.” Studytonight, Available here. 2. “Working with ER Diagrams.” Studytonight, Available here.